Getting your hair cut on a regular basis comes with many benefits. Most people will simply ignore their stylist when they tell them to schedule an appointment in four to six weeks for their next haircut. And while it’s true that you can probably get away with going a lot longer in between haircuts — especially if you are rocking a longer style — there are numerous benefits to sticking with a regular haircut schedule. And even better, when you take advantage of the salon services at Cobb Beauty College in Kennesaw, you can save more on the haircuts you need! Here are just a few of the many benefits of getting your hair cut regularly. #1. It helps to avoid hair-damaging split ends. Split ends are caused by the chemicals and products we use to keep our hair in check. They are annoying and unsightly, but some people choose to simply live with them because they believe that split ends really only affect the ends of their hair. However, that’s simply not true. If left for too long, split ends can actually travel up the hair shaft, spreading the damage to the rest of your hair. Haircuts help to eliminate split ends, which also prevents split ends from damaging your hair. #2. It keeps your hair healthy. Because haircuts help to prevent split ends and the damage they can cause, they help to keep your hair much healthier. And while haircuts don’t actually make your hair grow any faster, like the common myth suggests, they could make your hair look longer. That’s because breakage caused by split ends leads to frizz and other hair issues. If you skip your regular haircuts, your hair will likely look flatter, thinner and shorter than it really is. So even if getting your hair cut doesn’t physically make your hair grow faster, it could make it appear longer. #3. It prevents you from having to cut off too much. When you procrastinate your haircuts and allow the damage from your split ends to travel up your hair, it means that when you do actually get your hair cut, you’ll likely have to cut off a lot more than you might like to make it healthy once again. If you cut your hair on a regular basis, it will be a lot healthier, and how much you cut off will be entirely dependent on what style you want, rather than how unhealthy your hair is. Save more and get the regular haircuts you need with Cobb Beauty College. There are so many reasons to get your hair cut on a regular basis, but here at Cobb Beauty College, we know that all of those haircuts can add up fast. But the good news is that we offer beauty school haircuts that can help you save big. In fact, a basic haircut is just $5! All of our services are performed by our advanced students and supervised by licensed instructors, so you can rest assured that you’re getting the quality you deserve. 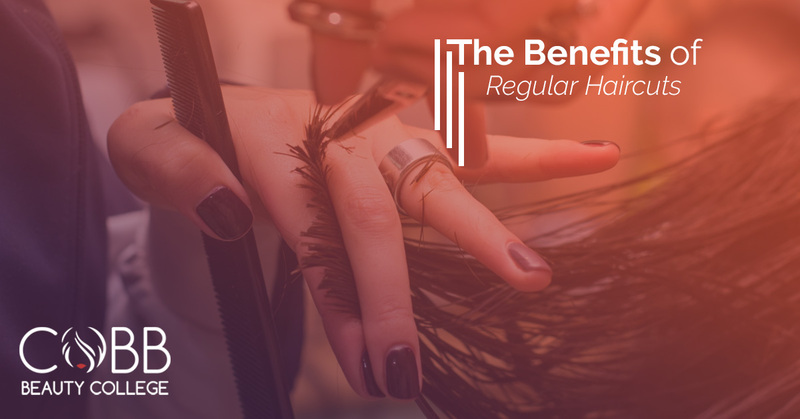 Schedule your beauty school haircut today, and stay tuned for our next blog to learn more benefits of regular haircuts.